Do you ever get the feeling that there are many more questions than there are answers? That despite being swamped with information it is almost impossible to reach conclusions? Well, it could be that you're an F1 fan, and the opening round of the season is near. At this point of any campaign nobody knows anything. And thankfully the fraternity's first race gathering of 2013 that we stand before - taking place this weekend in Melbourne - should offer us the first doses of clarity of who's quick and who isn't. Attempting to interpret pre-season testing must begin to offer an idea of what working in the intelligence services is like. It's a game of trying to work out what very clever people are trying to keep a secret from you. To repeat the mantra, lap times in F1 testing mean little; there are too many variables that we don't know (e.g. fuel loads, state of the track at that precise point) feeding into them to allow otherwise. And teams that feel that they are doing well and those that feel they are doing badly alike will almost certainly be playing bluff with the rest of us. Even by these standards the pre-season testing of 2013 was particularly cryptic. That the regulations' fundamentals have stayed constant since 2009, meaning we're into year five of their existence, meant major departures from the technical norm were thin on the ground. And for many of the same reasons, no one (aside possibly from Caterham) has created a dog of a car as far as we can tell. Yet this in itself may be instructive, the best evidence is that much of the F1 field for this season is close on laptimes. Further there is the possible existence of a 'big five' teams, with Lotus and Mercedes stepping up to join the usual suspects of Red Bull, Ferrari and McLaren at the sharp end. 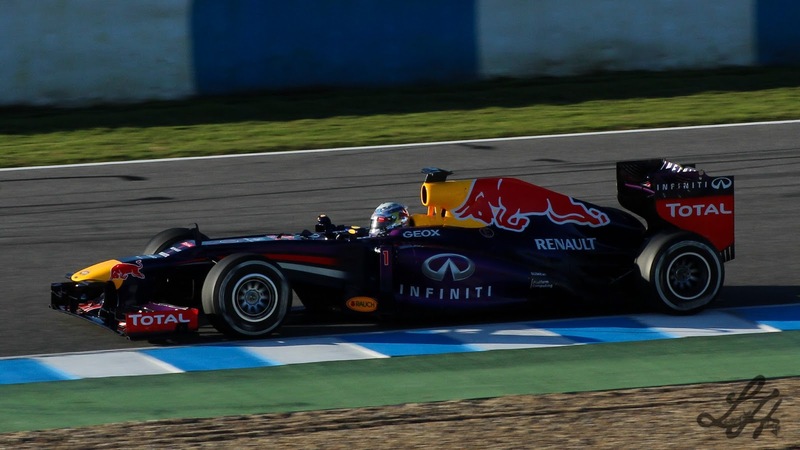 Some analyses have the five cars' ultimate lap times within about the width of a tyre of each other. It sounds therefore like this year will be like last year, only more so. More close, more unpredictable. Qualifying this weekend should be fun. 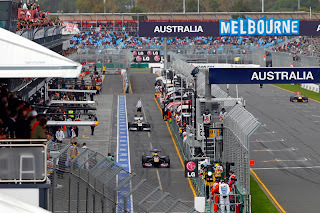 There is a lot that the avid F1 follower can find to whinge about on the subject of the modern F1 calendar, but visiting Melbourne, and more to the point kicking off the campaign in Melbourne, seems just right. The warmth of the local welcome and (sometimes) of the weather, allied with a passionate crowd attending in large number, all in the picturesque setting of Albert Park with Melbourne's cityscape providing the backcloth, seems a perfect antidote to a sparse off-season and cold and clinical test days. 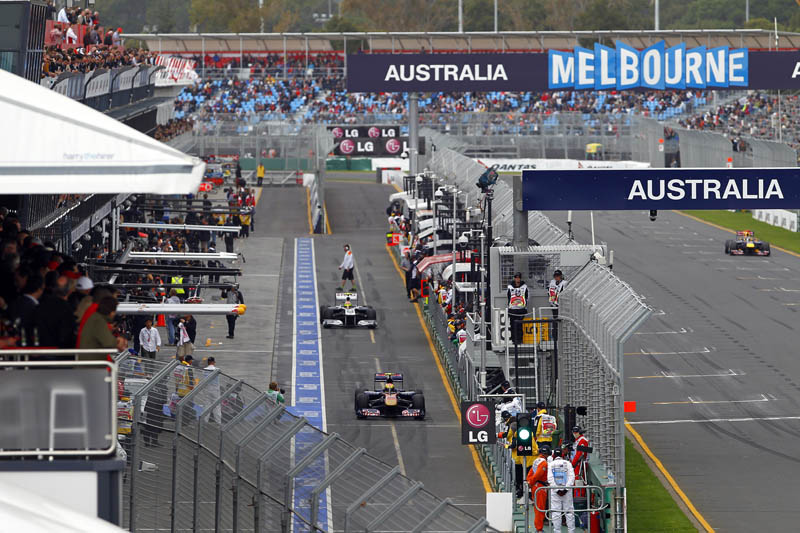 Some with long memories hark back fondly to Adelaide, the venue from which Melbourne claimed the Australian Grand Prix amid some acrimony and mystery in 1996. But beyond this it's hard to find fault with F1 at Melbourne. And even though tepid races around Albert Park aren't unheard of (I'm talking to you, 1998) it is one of those circuits on which one can reasonably expect a diverting race. Rather like with Montreal and Spa, stuff happens at Melbourne. Whether it is down to the low grip surface, close walls which punish errors, rustiness of drivers and teams, resultant frequent safety cars, unreliability of the new machines (not helped by dust and leaves getting into radiators), races around Albert Park have a madcap quality invariably, to the point that you are reluctant to turn away from the action for fear of missing something. Those not among the front-runners look at it, even this early, as one of the season's better opportunities of a strong result. So what are the local factors around the Albert Park track? Like most temporary circuits, the surface starts off by offering very little grip and rubbers in rapidly as the weekend progresses, making chasing set up more tricky than usual. And it rewards cars with a strong front end, particularly in the final sector of the lap. Good braking and traction is also needed. Further, even in the age of double DRS zones overtaking tends to be less straightforward here than at most circuits. Ordinarily this would add to the importance of a good grid slot, though the frequency of safety cars at Albert Park may yet be your salvation even if you don't get qualifying right. If F1's previous visits to Melbourne are a guide, then any of the four seasons can be expected weather-wise, even within the same weekend. There had been recent reports of scorching local temperatures, but these appear to be fading and there may even be rain on the Saturday and Sunday of F1's stay, in which case all bets will be off. Requiring a strong front end may be not good news for McLaren, as the MP4-28 has appeared prone to understeer in testing (Jenson Button's record is good at this venue though, having won on three of the last four visits). The McLaren also hasn't shown a great ability to hold its tyres together over a race distance, and this may be of particular regret this weekend as Pirelli has decided to live a little dangerously by bringing the supersoft, a tyre that most teams complained was not good for more than a handful of laps in testing (the medium is the other compound brought). The tyres are designed to give their best in higher temperatures than were the case in testing, and as we know the language of the apocalypse among drivers and engineers about the life of the Pirellis is an annual event these days, and the worst of these fears have yet to ever come to pass. But even so many eyes will be on the behaviour of the Pirelli rubber in Melbourne, and many engineers will experience headaches as a result. A 2012-style shock result if someone - by luck or judgement - gets it right remains a possibility. All at McLaren will however hope for as similar situation as in 2011, when it salvaged a decent result in Melbourne following a difficult pre-season. And this year's car apparently is inconsistent rather than disastrous thus far, so a chance remains that it may still find the sweet spot this weekend. Is Sebastian Vettel the favourite? But however cryptic pre-season testing is, these days the assumption up and down the pitlane is that whatever the laptimes and extrapolations say the Red Bull will be quick. 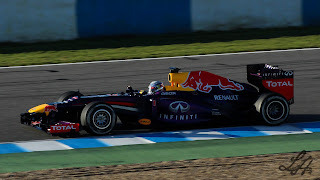 And many analyses of testing still have the Red Bull just ahead of the crowded pack, as did the evidence of observing the cars in action wherein the Bull drivers would at many points be able to keep their loud pedal on full as others kept theirs silent. And Adrian Newey cars historically have gone well around the Melbourne track, a trend going right back to the Williams and McLaren days. Indeed, the Red Bulls took the pole here in 2010 and 2011, as well as got a much stronger result here last year than testing had indicated. Pole and win for Sebastian Vettel may disappoint those looking for an unusual result, but it may also be the most likely outcome. Especially if Mark Webber's poor results (and luck) at home continue. Lotus might run the Bulls close though, in testing its car has appeared to handle well, displaying the sort of responsive front end that is required around Albert Park. Even better, the E21 looks to have inherited the E20's gentle touch on the tyres over a race stint, which is good news given that the supersofts have to be contended with in Sunday's race (assuming it doesn't rain). The team will need to get on top of its reliability problems of testing though. Ferrari one feels also will not be far away, though its slightly loose rear end seen in testing will not serve it so well in the track's many traction zones. And what about Mercedes, 2013 testing's great interlopers? Has it indeed, finally, got it right? There is more evidence than there has been in a good while that it has. But let's not forget that there have been plenty of false dawns at Brackley before. Including one revealed as thus at this very venue 12 months ago. But even though this weekend will provide some of the answers, it won't provide all of them. Those that don't do well will cling to the hope that the track's atypical nature will be their salvation, and that the car's pace will instead be revealed a week later in Malaysia. And even if they are off the front then they will look to the frenetic development race as the avenue to catch up. Being off the pace in F1 is a lot like the grief cycle: denial has to be got through before one reaches acceptance. Nevertheless, the qualifying hour and race this weekend should clear up a lot of our queries, at least for the here and now. Once the Melbourne visit is out bluffing will be a lot harder to sustain.